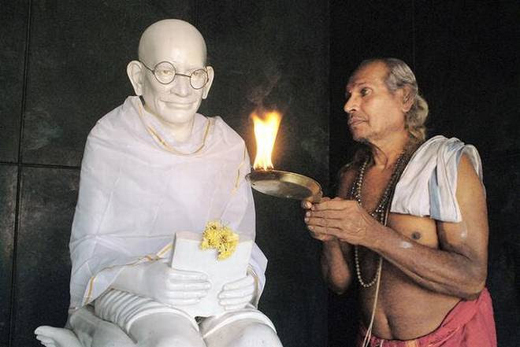 Udupi, Oct 3,2017:Marking with devotion Gandhi Jayanti, in Dakshina Kannada and Udupi district administrations was keen for resurgence to usher in Gandhian values. Mangaluru South MLA J.R. Lobo and others garlanded the statue of Gandhiji in front of Town Hall in Mnagaluru, after which retired pourakarmika Rudrappa was felicitated. Later, a programme of bhajans and devotional songs was held at the Town Hall. Inaugurating the celebrations in Udupi, district in-charge Minister Pramod Madhwaraj said that everyone has the responsibility to realise the dreams of Gandhiji to make the country self-reliant. Earlier, he garlanded Gandhiji’s statue installed at the same place (at Ajjarkad) visited by the Mahatma on February 25, 1934. Minister Madhwaraj also remembered the former Prime Minister Late Lal Bahadur Shastri, whose birth anniversary too falls on October 2. He inaugurated the Swatchchata Sapthaha programme and distributed badges to pourakarmikas. The release of a special edition on Gandhiji brought out by the Information and Public Relations Department was observed at both places. Not only singing Bhajans but our respect for him has to always remain in us . Let the respect remain in the minds of all Indians . He is the Father of our Nation.